12:49 the reason for entering this stop order is that in the Fractal Grid, there is a "Sleeper Buy/Sell point"
6/11/2010 2:16:07 PM MT TG****:: Thanks, a really nice week. 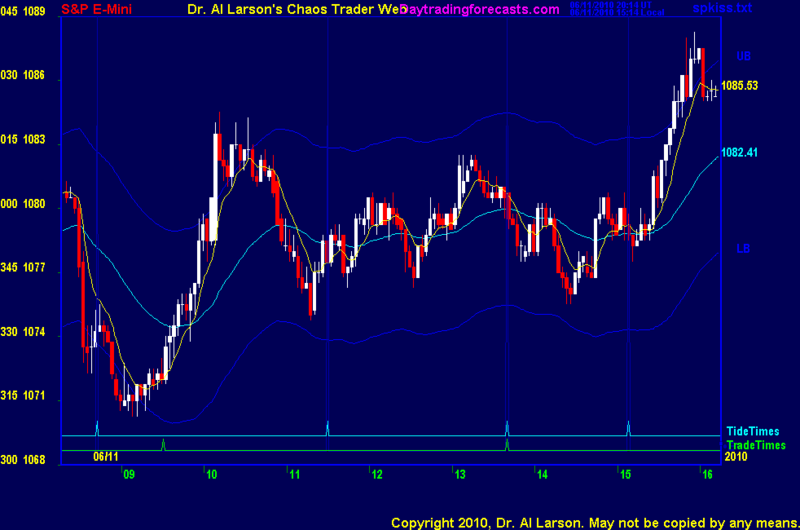 Al's chaos trading stuff works especially well at the current level of volatility. 6/11/2010 2:01:20 PM MT EOE:: Way to go TG!! 6/11/2010 2:00:10 PM MT TG****:: out for +10.5. 6/11/2010 1:48:43 PM MT TG****:: "this move came off the Moon +T270 flux; a 9 or 18 point move up is possible; 1076, 1085, 1094" well got above the 85, now wondering if the 94 is still out there. 6/11/2010 12:53:35 PM MT TG****:: Al, your comments and fractal grid helped me out today. Thank you in advance if this breaks out to the upside. Rebought 76.25 near 2:30 with a stop at 74.5. Looked feasible that the way you draw your up fractal grid was right on the money and the key low point for the day on it was being bent but not fractured. 6/11/2010 11:33:01 AM MT mm****:: Just kidding - LOL ! 6/11/2010 11:07:53 AM MT pl:: Al, are you looking on the open gap of last friday to be filled? 6/11/2010 10:57:19 AM MT mm****:: Two 20/110 crossings within 15 min. and you want me to enter ? 6/11/2010 10:07:01 AM MT TG****:: posted a comment in the CCT room re: the up fractal grid Al posted in there and the down fratal grid it is up against. 6/11/2010 8:04:00 AM MT MJ:: MT, likewise...so hard to trade at the moment. I'm glued to the TV! Viva Argentina! 6/11/2010 7:48:12 AM MT EOE:: Al, is there CC overlap? 6/11/2010 5:43:45 AM MT EOE:: GM everyone. TGIF. good luck.